The fieldwork at Slettnes Fyr has come to an end now. Here a short report to keep you updated on the season. It was quite a different season from last year in which we encountered no predation at all. 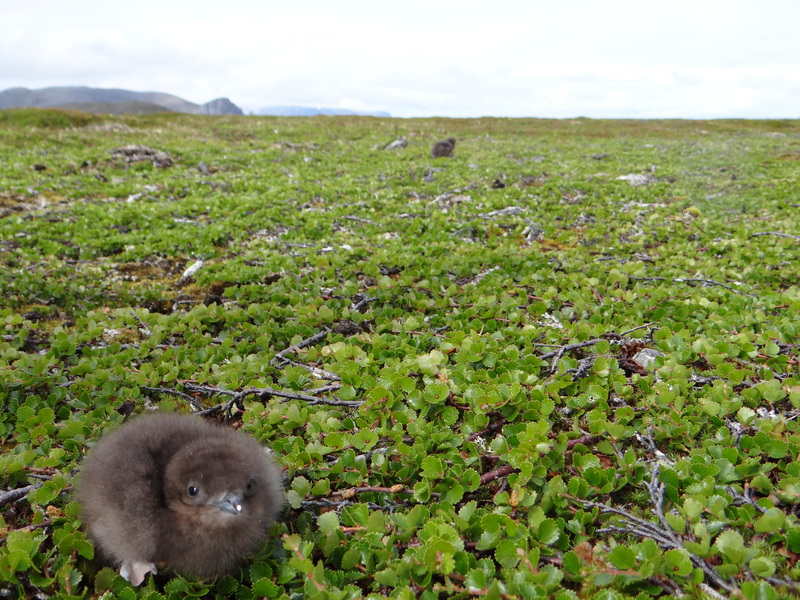 This year about one third of the Arctic skua nests were predated. We assume the main suspect is the red fox of which there were many in many widespread dens, that managed to raise young successfully. Also the food situation seemed bleak compared to 2014. There are several indications for that: Arctic terns did not breed, at Arctic skua nests mostly only one of the parents was present, while the other was at sea, most of the chicks disappeared shortly after hatching and we did not see any large sea mammals in the area. Also once caught very few skuas threw up fish. One skua even coughed up an adult passerine. Strangely enough the pair of great skua seemed to do fine with many large fish scattered around the nest. 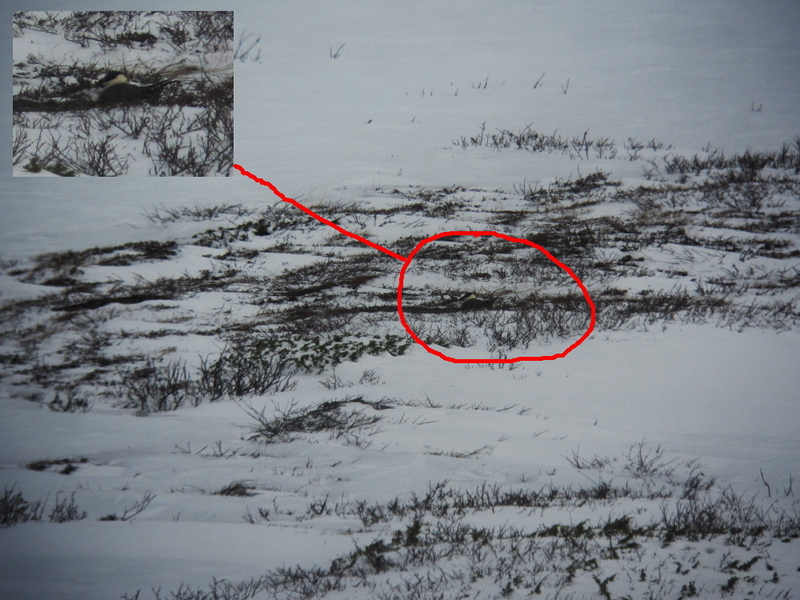 Another unexpected discovery was the fact that at least two of the loggered pairs relaid after predation. If the food situation is so bad that is not a thing to expect. Aggression levels were low, with very little response to us. All in all not a good year for them. For us it was quite successful, we resighted 28 out of 40 animals ringed last year and retrieved 24 geolocators. The data show an enormous range with equal shares going to West-Africa, South Africa, Venezuala/Brasil and South-Argentina. Three birds did something entirely different: one migrated over land to the mediterranean, one to the Caribean, the other to the Black Sea/Persian Gulf. All in all we managed to catch 54 skuas that got a new geolocator. Amongst these were 15 pairs. The phalaropes was less of a success story, only 3 recaptures from the 20 loggered last year. We employed 20 new loggers on both males and females. The team this year consisted of Daniel van Denderen, Hans Schekkerman, Daan LIefhebber and Ingrid Tulp. We received great help again from Cees Tesselaar who lives in Gamvik. 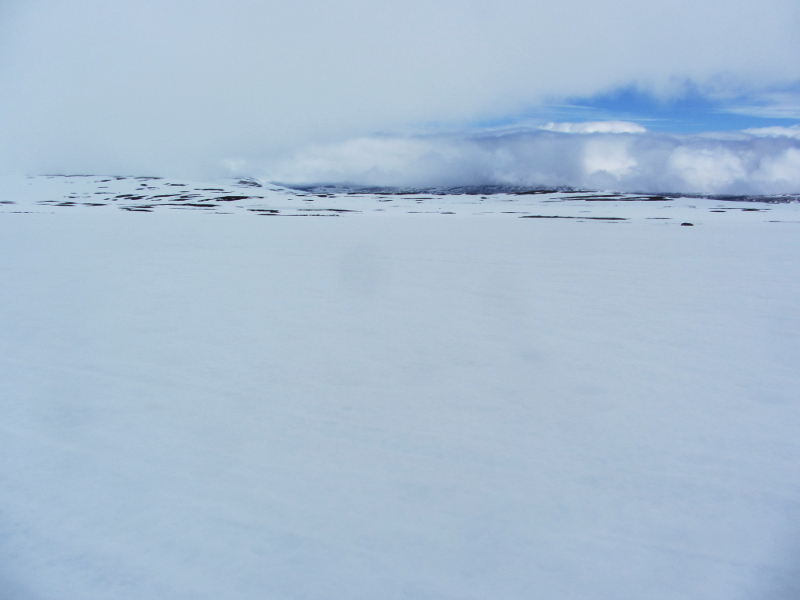 Another exciting field season in Ammarnäs started out with a lot of snow, but also a lot of rodents! This season’s team consists of Johannes Hungar, Piet Admiraal, Michiel Elderenbosch and Tim van der Meer. Coordinator Rob van Bemmelen could only stay for a week unfortunately, and in that week field conditions were not ideal. The first few days the team got a good impression on what a good breeding season it could be for the Long-tailed Skuas. Several nests were discovered and every day more were added to the list. 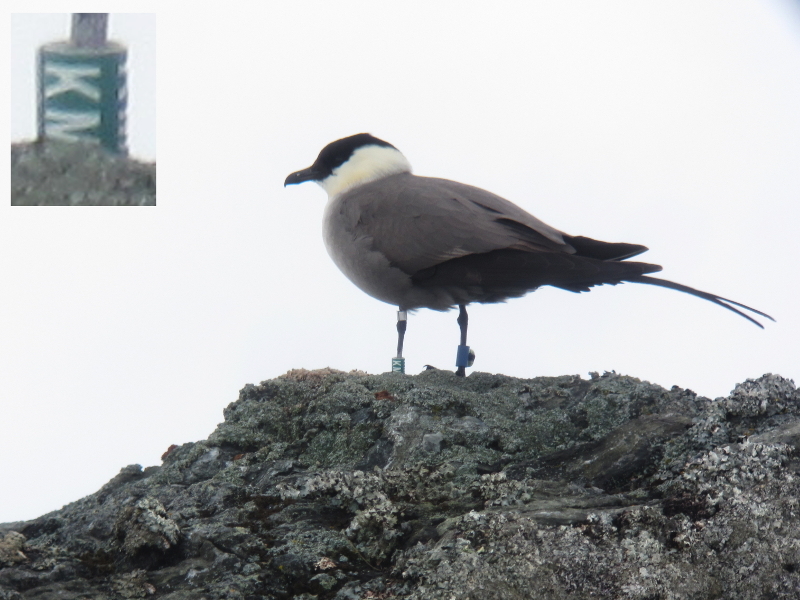 One of the main aims was to retrap Long-tailed Skuas with geolocators this year. Different birds had different amounts of data “on their legs” and the ones with up to four years were targeted by the team first. First captures were attempted with a snare driven by a vacuum-cleaner mechanism, an ingenious device developed by Rob. A good year for rodents often coincides with a good year for waders. 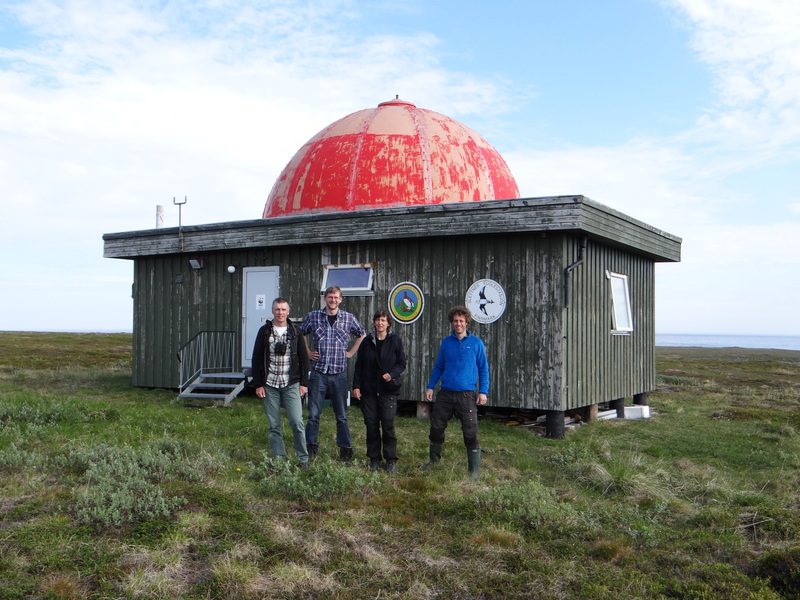 Johannes and the rest of the team found lots of nests of Golden Plovers, Redshanks and Dunlins. Tim found a Dotterel nest on his first day, and other highlights were 2 Whimbrel nests found by Piet & Michiel, another Dotterel nest and a Broad-billed Sandpiper nest found by Johannes. Several duck, Dunlin, Ruff and Red-necked Phalarope nests have also been found in the study areas. 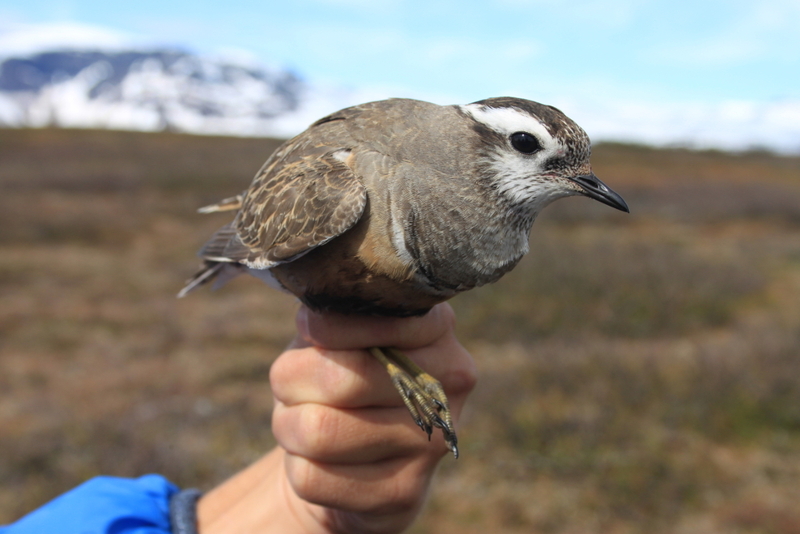 The Dotterel breeding in Gelmetje was safely caught on the nest with a walk-in trap and ringed (see its picture below). 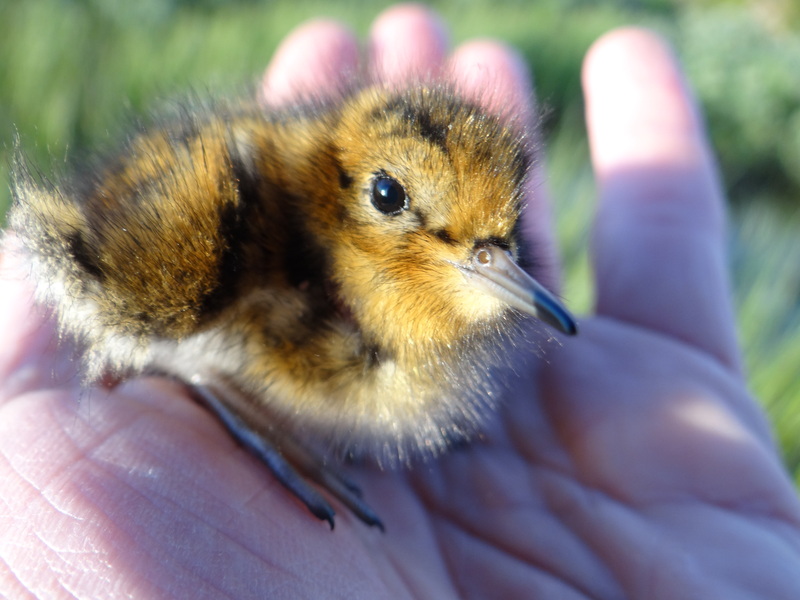 In the coming days, some of the wader nests will hatch, whereas others are predicted to hatch around the middle of July, much later than usual. It seems to be a lesser year for the Red-necked Phalaropes in Gelmetje. Due to the ice and snow-cover, they have started to breed late, and there seem to be less pairs than the usual ten. We have resighted two or three female phalaropes with loggers from last year, and captured one of them (see the picture below). Another ringed bird was caught, and turned out to be a female that should’ve had a logger but lost it! Unfortunately, no males with old loggers have been resighted so far. Long-tailed Skua nest visits and chick searches resulted in even more nests, and together with observations from Martin Green in nearby areas the highland plateaus surrounding Ammarnäs (Kraipe, Aivesjaive, Raurejaure, Gelmetje & Björkfjellet) contain at least 117 active Long-tailed Skua nests this year! A new record? Later in the season we used a new spring trap on the nest in Raurejaure, and captured the five last geolocator-birds of this season in one day. Two birds with four years of data were caught totalling up to hopefully 12 years of data collected in captures that day! Only a few individuals have evaded our traps and will hopefully be caught in subsequent breeding seasons. 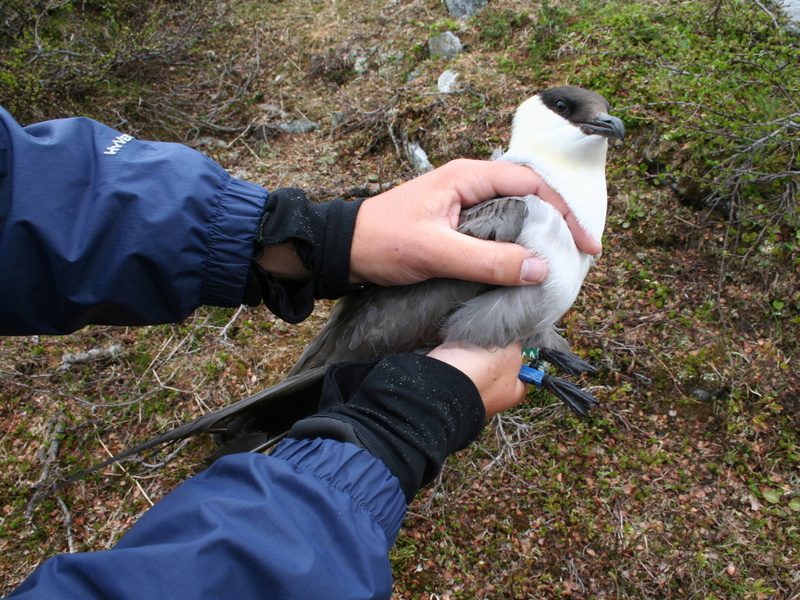 In total 32 Long-tailed Skuas have been caught this year, 21 handed in their geolocator, and 25 of them received new geolocators, whereas some birds are freed of their data collecting duties. Twenty-one. That’s the number of recaptured Long-tailed Skuas with geolocators. An extremely good score, especially since nine of these got their geolocator back in 2011. The manufacturer said – back then – that the estimated battery life would be 2-3 years. In at least two instances that was incorrect: these had (almost) four full years of data!! For the other ones, the battery life had ended and therefore we have to get some help from the manufacturers to download the data. The number of recaptures is especially high when one considers the difficulty in retrapping skuas last year. There is a number of changes, such as the hugely improved remotely controlled snare trap, the fact that I’m not there (…) and the different weather (last year had hot spells, this year has late snow melt), but I think the main difference with last year is the food situation. With the higher rodent densities, more pairs have laid more (mostly two, compared to often only one egg last year) and bigger eggs. This investment – and possibly also a perception that this must be THE year to reproduce (I would totally agree with them!) – may explain the noticeably higher motivation to incubate those shiny big eggs. 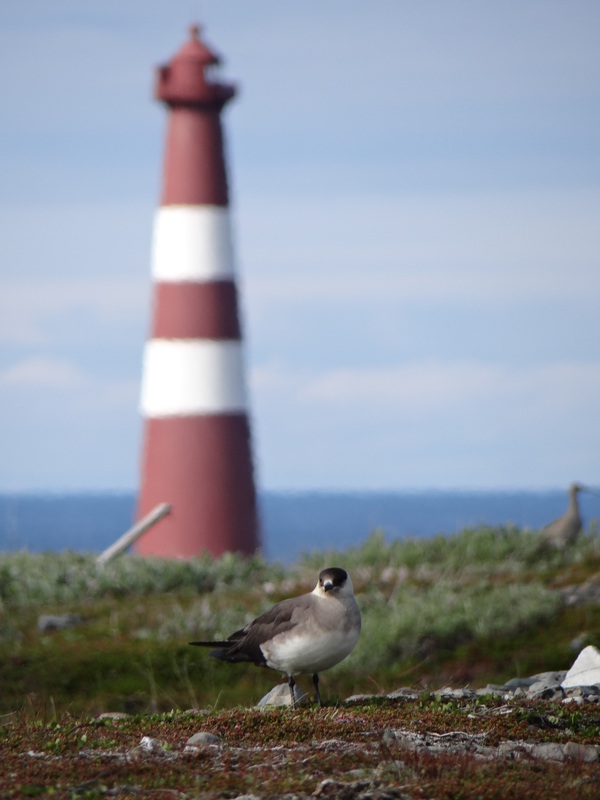 Also in Slettnes they had great success in recapturing Arctic Skuas, plus several Red-necked Phalaropes, and good news also came from Tobseda, where (until then) one Red-necked Phalarope and three Arctic Skuas were recaptured. More on that later! The whereabouts of KM, an individual that has featured in this blog several times. During equinoxes (when day- and night length is similar over a large part Earth), positions cannot be reliably estimated. Therefore, there are gaps in the track in March and September. Red depicts July-August blue October-February and green April-May. Geolocator position estimates are “not very precise”, so look at the bigger picture, not at individual points (such as in Scandinavia)! Individual AA starred in a recently published paper in the Dutch Birding magazine (please drop me a line if you would like to have a PDF). It is a short cautionary note about ageing Long-tailed Skuas, showing that AA retained barred underwing coverts for at least five years (and this year for its sixth year). In the literature, such barred feathers are related to immaturity, but this individual shows that this needs not to be the case. Obviously, this article is really for true bird nerds. AA back in 2011, when he first got his geolocator. The situation looks much less favourable for the phalaropes: all lakes in Gelmetje are still frozen. Just the day before yesterday a tiny bit of phalarope-habitat thawed. They are all in the delta waiting to get up. We regularly see birds taking off, apparently for inspection flights. Hopefully, they will be able to start breeding soon, because if they don’t, we won’t be able to retrap the individuals with geolocators and we won’t be able to deploy any new loggers! Meanwhile, I got home and Hans & Daniel just arrived at Slettnes. Hence, more news is expected soon! A fat little lemming; Piet in the background. KR or KJ breeding his/her two eggs, surrounded by fresh snow. With this amount of snow, it will be difficult to see where exactly this is even for experienced Ammarnäs-visitors! It is the view on Geppejaure, looking NE towards Gelmetje. First of all, we saw (and captured by hand!) two Field Voles and a Norwegian Lemming! If one can find live rodents this easily, there must be plenty – at least sufficient numbers for the skuas to find. Indeed, we saw two pairs with freshly captured lemmings that were torn apart and the intestines eaten. Its great to see how the male and female work together to rip the lemmings apart; each pulling on one end of the lemming! These observations also indicate that the skuas will breed this year; they only breed when there are sufficient rodents. We didn’t find a nest yet, but saw one individual ‘scraping’ to make a nestcup, and others were alarming and making territorial ‘long-calls’, indicating love is in the air. 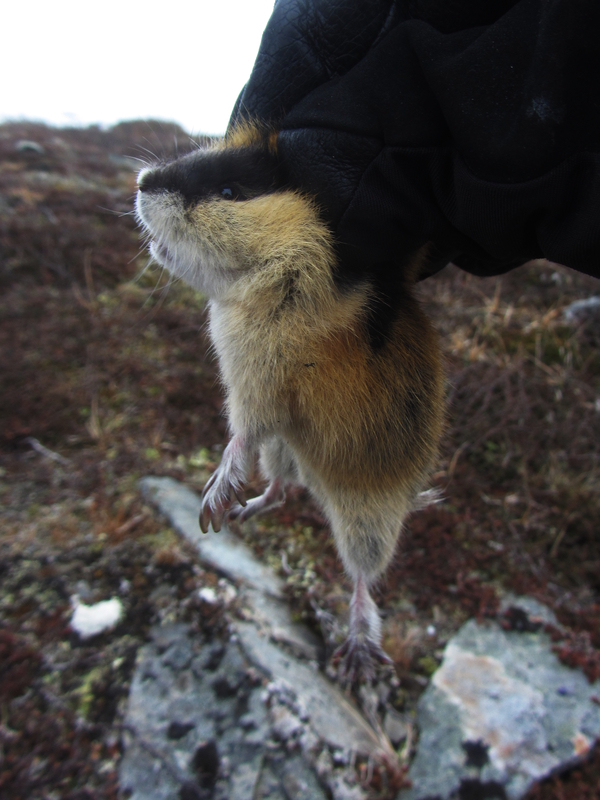 This Norwegian Lemming, held in Michiels’ iron grip, weighted 35.4g, which is about half the weight of lemmings in the peak year 2011. KM is present again. This bird wintered in the Benguala Current (close to South Africa) in the past years. Meanwhile, many waders and the usual Lesser White-fronted Geese are still in the delta next to the village, waiting for the snow to melt so they can start breeding. Amongst them are several hundred Red-necked Phalaropes; a fantastic sight! 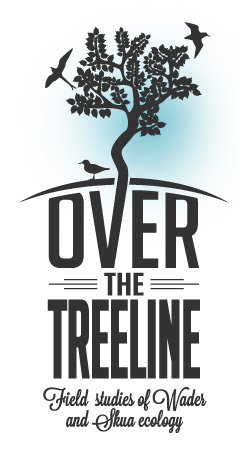 It’s been along time since anything appeared on the ‘over the treeline’ blog, but with the 2015 field season approaching it is a good moment to look back on the past winter and to look forward to the plans for the coming months. Next week, I’ll leave for Ammarnäs with Piet Admiraal and Michiel Elderenbosch. Both bird ringers, they will have a major role in the fieldwork, as I’ll be leaving very early this year (7 June) to get back to my pregnant girlfriend in the Netherlands…! The famous Johannes will join this year (bringing his family up to Ammarnäs. Johannes, Piet and Michiel will later be joined by Tim, who will bring his phalarope catching skills back for his second season in Ammarnäs. Guido and Fons will also visit for their second year, and will round up by (colour)ringing skua chicks and catching some more phalaropes. 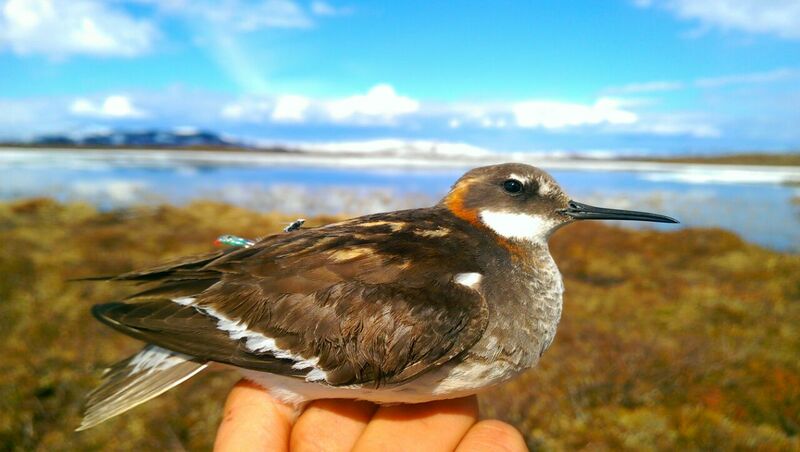 The main aim for this season is to retrap skuas and phalaropes carrying geolocators and deploy new loggers. There is a number of questions that we hope to answer using the data obtained from these loggers. In a large collaborative study combining geolocator data from Greenland, Iceland, Scotland, Sweden, Norway, Finland and Russia, we’ll aim to describe (contrasting) migration strategies and routes across the North Atlantic. 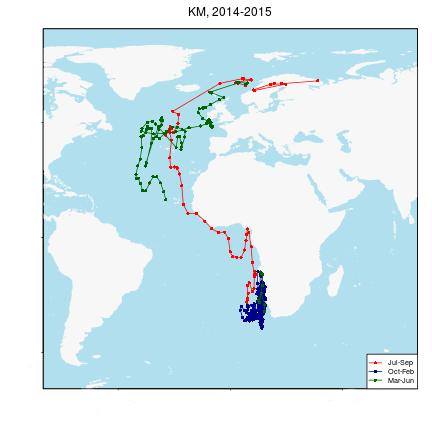 The migration routes and wintering areas of Red-necked Phalaropes breeding in the Western Palearctic have long been debated, in particular those breeding on Iceland and other North Atlantic islands. These populations may winter in the Pacific Ocean, while the Scandinavian birds should all winter in the Arabian Sea. It seems like the pattern in lemming densities of the early ’80s is repeating. 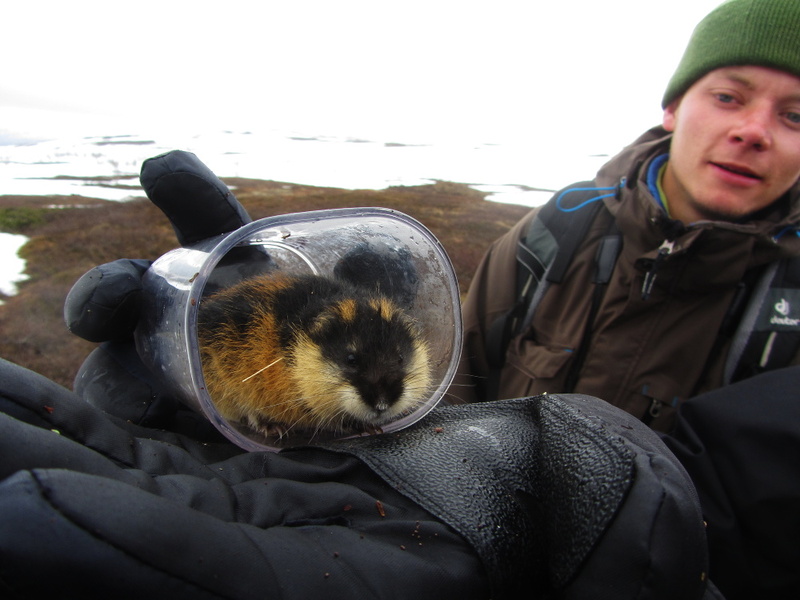 Following a huge peak (2011), two low years (2012-2013) and a mediocre year (2014), there are some rumours about good lemming numbers this spring. This is expected to result in a good number of breeding skuas. Hopefully they will be willing to hand in their geolocators, but with new techniques and a very eager field crew, I trust this will be a succesful year! Meanwhile, a team (Jasper Koster, Thomas Lameris and Stefan Sand) has already left to Tobseda, Russia, to retrap Arctic Skuas and Red-necked Phalaropes. In the first week of June the first field crew will leave for Slettnes, focussing on the same species set. Hans Schekkerman and Daniel van Denderen will leave first, followed after two weeks by Ingrid and Daan Liefhebber. Let’s hope for a good number of retraps!